In a wok or large non-stick frying pan, add the butter. Stir-fry the bell pepper and carrot. Once bland, add the bean sprouts. Salt, to taste. Let the vegetables cook for 4 minutes, stir in the rice and soy sauce. Add the tuna and let the rice rest for a few minutes. Incorporate mushrooms or any of your favorite vegetables for a personalized version. Having recipes such as this one on hand is always a good idea. Especially when you're in a time crunch and want to prepare something that’s both tasty and satisfying. This vegetable-tuna rice dish fits the bill and is ready in less than 30 minutes. You can use whatever ingredients you find in your refrigerator and it's sure to delight you and everyone at the table. 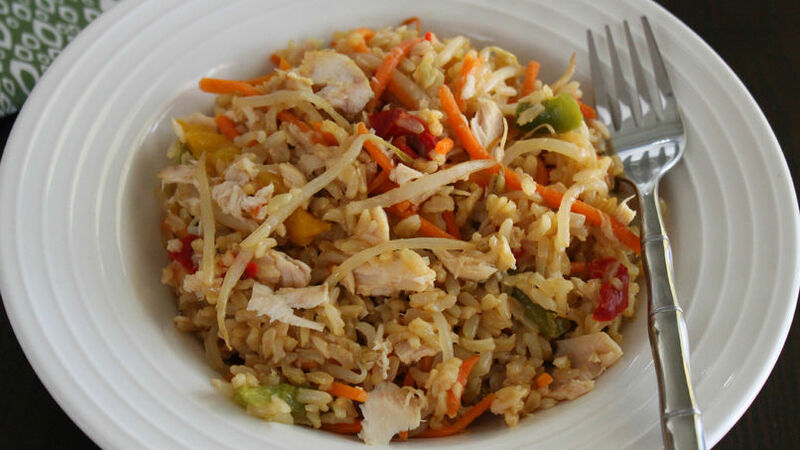 When you're really pressed for time, use leftover rice and add your favorite veggies and meats. With this particular dish, I use Jasmine rice, but you can use any variety you like. What is your favorite rice combination?